Ask fellow campers about "Rockville Lake Park" and nearby attractions. We only stayed here for one night on our way through the area. The woman who checked us in didn't seem to know too much about the park, i.e. trails, etc. We were in site AA-36, a pull-through which worked fine once we figured out that we were side by side with the neighboring motorhome, with our rigs facing opposite directions. The utility hookups were in the center between us, and it was a long run for some of the utilities. It would be nice if the website for this park would have a diagram of each site's location. We would have picked a different site. The park itself is very nice, lots of open fields and trails through the woods. We saw a deer and two fawns in the afternoon. It was very quiet and pleasant. Of course this was midweek after school started locally. Unfortunately we didn't get any Verizon service, which is important to us for more than a one night stay. We camped at Rockville Lake Park in a Motorhome. We stayed one night while touring the covered bridges in Parker County, Indiana. Site 30 was a pull through and we had no neighbors. Many families and children present and active. Enjoyed walking the dogs on the park roads. We camped at Rockville Lake Park in a Motorhome. First to say that we were very impressed with the facility. We found it to be family friendly, pet friendly, and really quite peaceful. There was lots to do here, including nature trails, playgrounds, horseshoes, and a large fishing lake. We knocked down our review points a bit because we had to move our rig into 3 different spots before we found one that would really work. Our first site, #36 (pull-through), had a sewer hook up about a foot and a half off the ground. This made it impossible to dump or to support your hose appropriately. In fact, when we tried to dump, the height and weight on our sewer hose was so great that it broke! Luckily it was grey water and luckily we were able to fix it without much trouble. Staff was VERY accommodating in moving us, but was quite clear that no refunds were possible. At all. We next moved to site #30 (back-in), but water and electric utilities were on the wrong side of the rig and our water hose wouldn't reach. We then moved to site #31 (back-in). All was good there, but it was certainly a hassle to move 3 times. Know that sites 30 and 31 were 50 amp only. We had to get an adapter from the front desk and they took our credit card as a deposit. We would absolutely camp here again, but only knowing the right spot. In order to save on utility installation, it looks like electric and water were only installed at every other site. Be aware of this when making reservations and make sure that your hook-ups are quite long. We camped at Rockville Lake Park in a Fifth Wheel. This is our third time we have stayed here, and we enjoy it every time. It's quiet, shaded and clean. We can bring in our own firewood and ride in our golf cart on the trails. We will definitely go back. We camped at Rockville Lake Park in a Motorhome. Very nice park, but it is usually all reserved unless you camp in the Primitive sites, which are in abundance! There is a really nice Beach, and Great playgrounds. GREAT FISHING!! 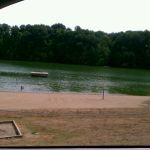 We camped at Rockville Lake Park in a Travel Trailer. Only 49 RV sites, but at least 100 or more primitive tent sites available. Our site was electric/RV only. Basically a parking lot with campers parallel parked. Not easy an easy set up. There are only 4, very dirty showers for the entire camp ground and located in the full hook-up section. Water would be cold, then scalding, then cold and only stay on for about 15 seconds at a time. This is a very poorly planned park. The only dump station is located in the full hook up section, not near the exit, and it was full when we got there. Also, only two small dumpsters, which were also full and not conveniently located. There is a camp store in the check-in station with very little to offer. All in all, we will not return or recommend this campground. We camped at Rockville Lake Park in a Travel Trailer. Are you affiliated with Rockville Lake Park ?